When some companies call, top tech talent can’t answer fast enough. But when your business lacks the name recognition or the enviable “cool factor” that some leading employers enjoy, recruiting in-demand tech pros can be hard. It can also be time-consuming: A Deloitte study found that it can take businesses up to 94 days to recruit highly skilled tech talent. So, what can your business do to compete more effectively against the cool kids on the block? 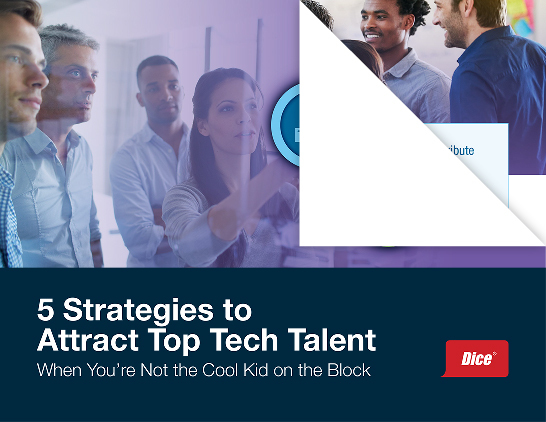 We’ve identified five strategies that can help companies strengthen their employer brand and employer value proposition — and ratchet up their cool factor so they can become a magnet for top tech talent. Download Dice's eBook to learn the strategies that can help you be more successful at authentically building a team of loyal and enthusiastic tech pros who believe your company is, hands down, the coolest place to work.